Alex Gibney's latest documentary is a fascinating portrait of both Armstrong himself and the mechanics of the lie he maintained throughout his seven Tour de France victories, though there's little in the way of dramatic new revelations and Armstrong proves as slippery as ever. 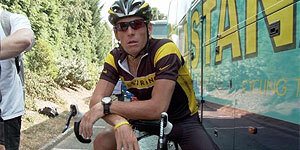 Directed by Alex Gibney, The Armstrong Lie began life as what was intended to be a chronicle of cyclist and cancer-survivor Lance Armstrong's 2009 comeback, before his stunning confession on the Oprah Winfrey show (in which he admitted to using performance-enhancing drugs) forced Gibney to rebuild the documentary around that story. Using interviews (including two 2013 interviews with Armstrong), archive footage and lots of beautifully shot footage from the 2009 Tour (you can see why Gibney didn't want to throw it away, but he uses too much of it here), the film traces the rise and fall of Armstrong's career (including his battle with testicular cancer and subsequent charity work), with talking head contributions from fellow team-mates, journalists, racing officials and even Armstrong's dodgy doping doctor, Michele Ferrari, who's something of a gift to the film, grinning from ear to ear and cheerfully spilling the beans on how the doping was done. Armstrong himself emerges as a fascinating, yet deeply troubling figure - there's no real hint of remorse and it's hard to take anything he says seriously since you already know how proficient a liar he is. The waters are further muddied because his primary defence (that everyone around him was also using drugs and it was essentially 'Dope or go home') turns out to be true - he was just better at it than they were. What the film does do is help you fully understand the anger surrounding Armstrong, even today - it wasn't just that he repeatedly lied about his drug use, it was the fact that he used vicious, bullying tactics to discredit and destroy anyone who tried to speak out against him (some of whom are interviewed here). The film also makes clear that the sports governing system itself made it easy for Armstrong to get away with it for so long and that there was essentially a cover up to protect their most lucrative star, who, not coincidentally, was also making millions for cancer charities at the time. What's also interesting is the circumstances leading to his confession - it was only his failed 2009 comeback (for which he still claims, on camera, that he wasn't using drugs) that led to his downfall, which makes you wonder if he would he have gotten away with it if he'd decided to call it quits after seven victories. And if you believe that he was genuinely drug-free in 2009, does that mean that it was his desire (and failure) to win without performance-enhancing drugs that led to his disgrace? The Armstrong Lie is a well-made documentary that's by turns fascinating and frustrating thanks to its complex and intriguing, if ultimately elusive central subject.